In Chinese symbolism the dragon and tiger represent the union of heaven and earth. The heavenly dragon symbolizes the male principal of yang and light, and the earthly tiger the female principal of yin and darkness. Here an old tiger gazes up wistfully at a young dragon, whose fiery red serpentine form coils amidst thunderclouds as he unleashes a storm of hail and lightning. 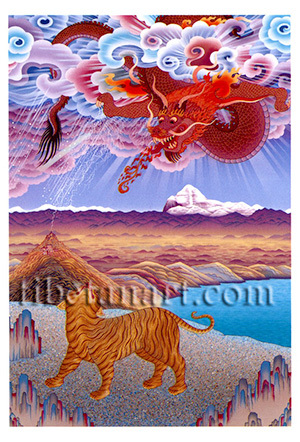 The landscape depicts the sacred Tibetan lake of Manasarovar with the holy mountain of Kailash appearing on the horizon. A bolt of lightning, which emanates from the dragon's right claws, descends to touch the hilltop site of Chiu Gompa, the 'monastery of little birds', which is situated upon the western shore of Lake Manasarovar.